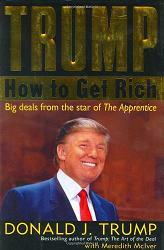 Click here for 4 full quotes from Donald Trump in the book Trump: How to Get Rich. Tell people you�re successful or they won�t know it. Good management requires hiring good people. Lessons: stay focused on big picture. The above quotations are from Trump: How to Get Rich, by Donald J. Trump and Meredith McIver, published March 23, 2004.